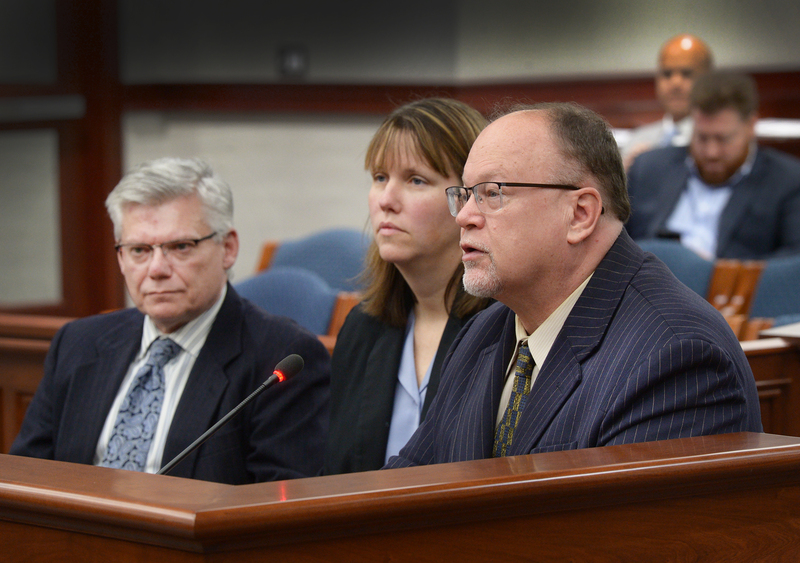 LANSING, Mich. — Sen. Jim Runestad, R-White Lake, Assistant Wayne County Prosecutor Dennis Doherty (left) and U.S. Postal Inspection Service Representative Carla Menendez testified before the Senate Committee on Judiciary and Public Safety Thursday on Runestad’s bill to deter mail theft in Michigan. Senate Bill 23 — along with SB 24, Sen. Peter Lucido’s companion legislation — would make state penalties for mail theft mirror federal penalties to allow more options for state prosecution of these crimes. The Senate Committee on Judiciary and Public Safety is expected to vote on the bills after hearing further testimony in the coming weeks. Note: For a print-quality version of this or other Runestad photos, click the image or select Photos from the In the News drop-down menu, above.